It’s been awhile, so let’s give something away. Hold on a second while I open my hope chest. So many things to choose from that I want to give away: My Spork collection, Bob Schneider, the TX vs. OU game. 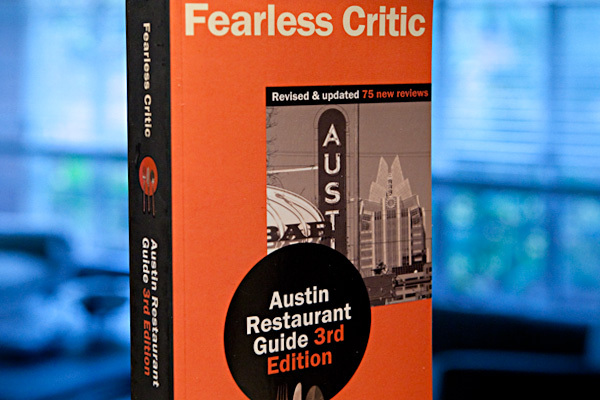 Here is the tome that is all things critical on restaurants in Austin, the Fearless Critic Revised & Updated Austin Restaurant Guide (3rd edition). It took so long to type out the title I think I just got hungry. You can disagree with it, but you can’t call it skinny. Roughly the size of Lambert’s Pulled Smoked Pork Cuban sandwich, it contains reviews of 500 Austin eateries. Sign up today and this spanking new copy can be yours. Entries accepted starting today through noon, Oct. 7th, 2010. I’ll use www.random.org to select the winner. Only one entry per person. As usual, void where prohibited, blah, blah, blah (insert legal mumbo jumbo here). Your email address will remain private. I just need it to find you when you win.